PHOTO BY JOHN MONTGOMERY Above, Mohawk’s Destini Oler finishes the 800 in 2:15.1 Saturday at the state track meet at Jesse Owens Stadium in Columbus. COLUMBUS — She had the experience, both from past meets and from the day before, as well as confidence. At least for a while. But make no mistake, a little fear also crept in. But just for a bit. After that, Mohawk senior Destini Oler just outran everyone. 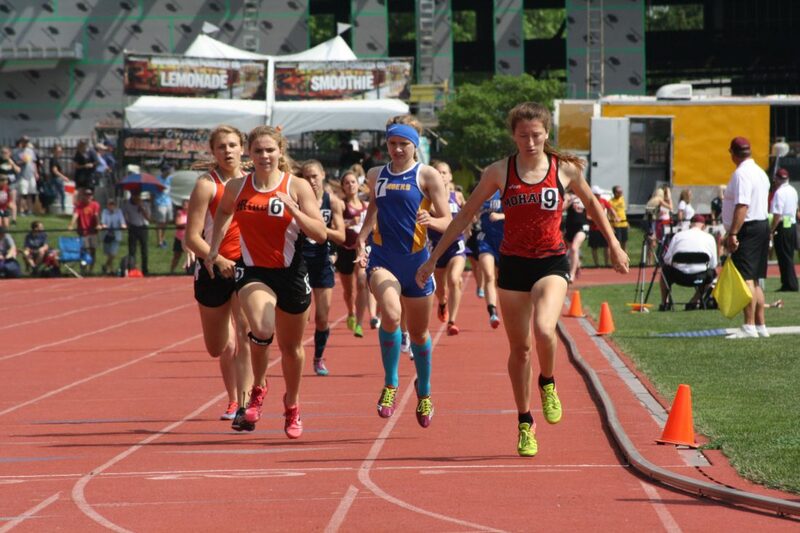 Oler captured the Division III girls 800 Saturday in a personal-best 2:15.1, one year after taking seventh in the same race and a day after leading the first leg of the 4×800. When it was done, Oler had claimed Mohawk’s first state track title since 2004 and the first in a running event in school history. But first, she had to have maintain that belief. The senior started in Lane 9A, and the staggered start meant she couldn’t see the rest of the field until they reached the cut-in mark 300 meters into the race. Oler had the lead, but had to angle her way across the track toward the turn at the start/finish line, with several other competitors right there with her. She did, but not by much. Northwood’s Trinity Fowler took second at little more than a half second later (2:15.64), with Minster’s Madeline Magoto right on her heals (2:15.7). “She probably ran a little bit faster yesterday in the 4×8, but, man, she just looked good,” Mohawk coach Brock Cleveland said. “Led that thing from wire to wire. But he expected that, starting with Oler’s trip to the podium’s seventh step last year, all through the regular season, and then dominating performances at the district and regional meets before reaching state. “She was super relaxed, she was super poised (entering state this year),” he said. “When we started the season, she had one goal in mind and that was to be sitting on top of that podium. And that’s what I told her before she ran, I told her a couple things. “I said, No. 1, remember why we’re here. And No. 2, leave your mark, this is it, this is your last opportunity to do that. And she took advantage of that,” he said. And finally reached the top step at state.